A soft t-shirt that feels great on-- with 3/4 sleeves. 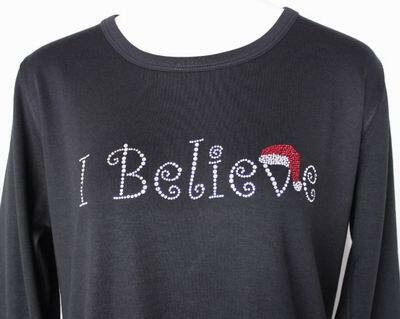 Design is all Christmas Red and clear crystal colors in rhinestones that says "I Believe" with a Santa Hat on black. Makes a great gift or Christmas party outfit.